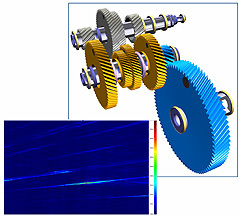 "High Standard Solutions for the Virtual Product Development Process in Power Transmission Engineering"
Simulation of dynamics and vibrations of rotating multiple spur gear pairs in gear trains. Analyzing the driveline and transmission for rattle and dynamic transmission errors in combination with the crankshaft, dual-mass flywheel and clutch in full 6DOF. 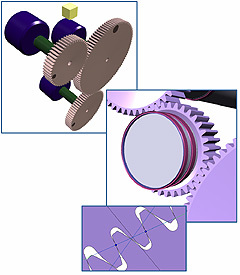 Simulation of dynamics and vibrations of planetary gearbox arrangement with serveral stages.